Specializing in Antique & Collectible Books. Visit us online for more antique books & collectibles. 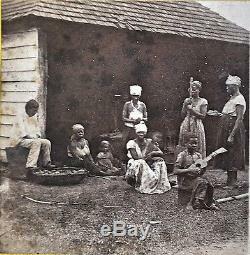 1860's Civil War Stereoview Slaves Cuba Plantation. Very Rare Original Civil War Period Stereoview of a plantation view in Cuba. Slavery Kitchen of a Barracoon. A group of slave woman tend to there children, and prepare food in a primitive outdoor kitchen. One women holds a plate of food, while another churns butter. A handsome young boy, bare foot, plays a guitar and looks directly into the camera. This dates the stereoview to a 2 year window (September 01, 1864 - August 01, 1866) during which time such stamps were required on certain luxury items to raise funds for the Civil War. CONDITION - In very good condition some general toning and browing. Higher value items will always be fully insured and trackable at no extra cost to you. Please note that we always collate and describe the items we sell to the very best of our ability. The item "1860's Stereoview CIVIL WAR ERA Cuba SLAVERY, PLANTATION, BARRACOON, SLAVES" is in sale since Wednesday, August 31, 2016. This item is in the category "Collectibles\Photographic Images\Vintage & Antique (Pre-1940)\Stereoviews". The seller is "regencyantiquebooks" and is located in Phoenix, Arizona. This item can be shipped worldwide.